In Europe, the best vans come with a certain cachet. You can rent a vintage VW camper van, for instance, and tour the Scottish Highlands. In the United States, however, vans are associated with utility. No one buys a van unless they’re an electrician, a daycare director or an Iron Maiden cover band. Now, at last, that may be changing. Adventurous spirits are discovering that full-size vans are great for camping, surfing, road-tripping, off-roading and even living. 1. You can take the party with you. If you regularly shuttle around more than four people, your vehicle options are limited. Most people choose a third-row SUV or a minivan. Trouble is, big SUVs can be expensive. On the low end, $25,000 for a base-model Kia Sorento or Hyundai Santa Fe. But on the high end, $70,000 for a fancy Ford Expedition or GMC Yukon. And minivans are… minivans. Full-size passenger vans are affordable and can easily seat five, seven, 12 or 15. 2.You can carry a LOT of stuff. Even a small Ford Transit Connect Wagon — basically, a minivan that’s not a minivan — is a cargo champ. With both rows of seats folded, it can carry 104 cubic feet of stuff. That’s more than a Tahoe, Car and Driver points out. Bigger cargo vans can haul nearly five times that amount. 3. You can sleep — or live — comfortably in a van. 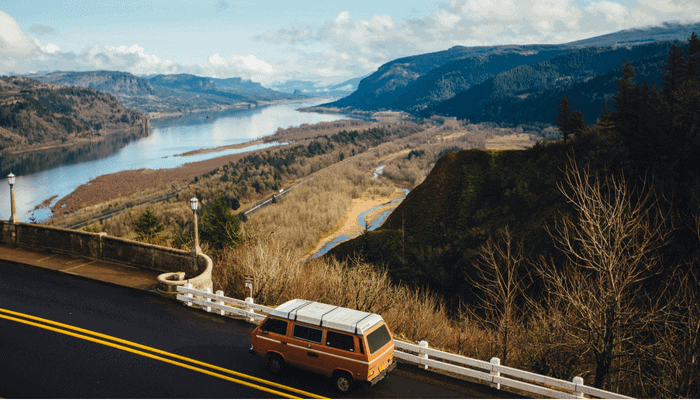 Whether you want to stretch out for a few nights or live the nomadic life for months, a van is the way to go. A van’s not a gas hog like an RV, and they can be customized to add beds, storage and even kitchens. Are you feeling van fever yet? Here are a few of the best vans you can buy. The Ford Transit Connect has it all: seating for 7, 20/27 city/highway gas mileage and plenty of room. It even has a sort of adorkable charm, with a stormtrooper-esque grille and boxy rear. The rear seat backs can be folded down or removed, and the front passenger seat back can be folded flat to serve as a writing or eating surface. And with a few modifications, the Ford Transit Connect is one of the best vans for “stealth” sleeping, a.k.a. living in a van without anyone knowing. Here’s a Transit Connect with a wooden bed frame that’s also a food storage area, a camp stove, solar-powered LED lights, and even a solar shower. And here’s one with an even more homey layout: kitchen cabinets, a cooktop that swings out for al fresco cooking, a microwave, a tiny fridge, an awning, and a solar panel. 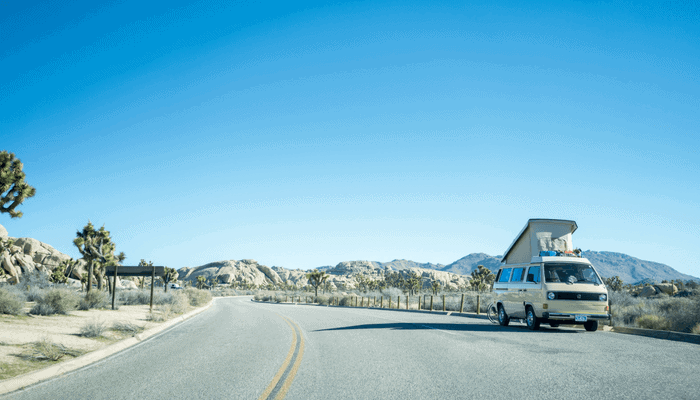 If you’re a child of the ‘80s or ‘90s, you may have fond memories of road-tripping in a conversion van with cushy captain’s chairs and rad racing stripes. Guess what? A lot of those are still on the road — and they’re relatively cheap vans to buy these days. A quick search of conversion vans for sale turns up many for as little as $3,500, such as the Ford E-150, the Chevrolet G1500 and the GMC Savana. Will it have more than 150,000 miles? Definitely. Will it have curtains and a VCR? If you’re lucky. However, the captain’s chairs are as cushy as ever. Go ahead — try them out. We’ll wait. The Mercedes-Benz Sprinter van is a well-built, sleek cargo van that has a secret superpower: four wheel drive: “A push of a button switches the van from a two-wheel-drive hauler into a four-wheel-drive off-roader that just happens to carry a massive volume of stuff,” as Car and Driver puts it. The 4WD Sprinter handles rock-studded, steep dirt roads with ease, making it perfect for fleeing zombie hordes or an alien invasion. Watch it in action here. On the inside, the Sprinter can carry up to 487 cubic square feet. After teasing van fans for years, Volkswagen is reportedly close to producing an electric van that takes style cues from the classic Microbus. A concept vehicle called the I.D. BUZZ, which premiered at the 2017 Detroit Auto Show, is a two-toned, playful van with powerful batteries and a range of 372 miles. Here’s the bad news: this sweet electric van would go into production in 2022, at the earliest. “In the year 2025, if man is still alive, a production version is likely to offer Level 5 autonomy, also known as full autonomy with eyes-off-the-road capability,” Autoweek reports. Not feeling even the best vans, but still want a vehicle that can fit a kayak, a dog, and a sleeping bag, too? Check out our list of six great adventure cars.